Kolkata, March 20: Head coach Jacques Kallis feels two-time Indian Premier League (IPL) champions Kolkata Knight Riders (KKR) are as balanced as they can be going into the new season with more fast bowling options than last year. "We are as balanced as we could possibly be. You play on a lot of different wickets throughout the tournament and I think we have got our bases covered. But having said that, you got to perform on the field. 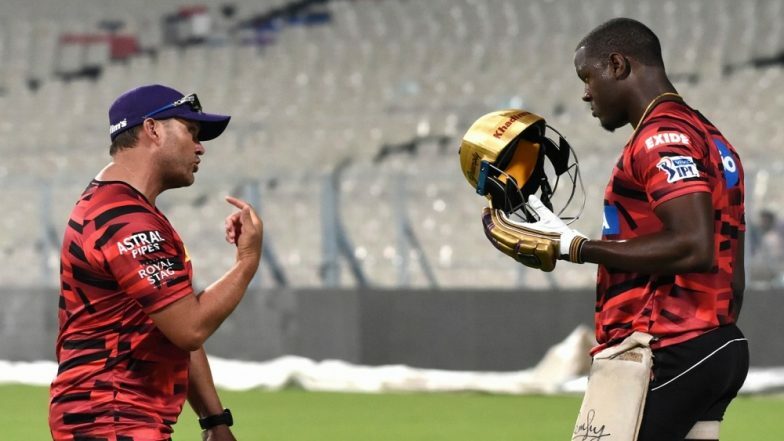 It doesn't matter what the team looks like," South Africa legend Kallis told reporters ahead of KKR's practice session at the Eden Gardens on Wednesday. "One thing that we do have this year is few more options in the fast bowling department, which is a big plus for us. "We probably needed one-two more options in the seamers' department last season, an issue which we have addressed this season," Kallis stressed. KKR have added New Zealand fast bowler Lockie Ferguson, left-arm Englishman Harry Gurney, who is known to have a lot of variety, and West Indies all-rounder Carlos Brathwaite to their pace attack this season. However, the franchise received a blow on Wednesday after zippy South Africa quick Anrich Nortje was ruled out of the IPL after sustaining an injury. Kolkata Knight Riders Tickets for IPL 2019 Online: Price, Match Dates and Home Game Details of KKR in Indian Premier League 12. The purple brigade also have experienced all-rounder Andre Russell to chip in with the ball. Among the Indians, KKR lost U-19 quicks Shivam Mavi and Kamlesh Nagarkoti to injury and will expect Prasidh Krishna and little-known Sunil Warrier to step up. KKR's weakness last season was their fast bowling department and before the auctions this time, the Dinesh Karthik-led side released Tom Curran, Mitchell Starc, Mitchell Johnson, Vinay Kumar and Vidarbha seamer Apoorv Wankhade. As far as their batting is concerned, KKR's top seven have no spare tyres with the likes of Chris Lynn, Shubman Gill, Russell, Karthik and Brathwaite packing enough punch to rival any other side. Kallis sounded confident about his team's batters, saying they gave a good account of themselves last season and would look to deliver the same this time. "From the batting point of view, I think we batted really well last season. So I'm excited with the team make up." Asked whether the impending World Cup would be a distraction for the hopefuls, Kallis said: "The World Cup is there. We are not going to hide behind that fact, but I can assure you that the players will try their best in every game they play. "As much as it is in the back of their minds, their focus will be on the IPL to get into good form and do well in under pressure situations. That's the best way to prepare for a World Cup. If they do well in the IPL, selection will take care of itself." Kallis also maintained that workload management of players is a personal thing and the support staff will aid the players to stay as fit as possible. "The guys are also professionals. They will know when to rest. We got a great support staff, physios and trainers...they know how to handle the guys. We have full confidence in them and their calls on how the players are doing," he said. Kallis did not reveal too much about the team combination when quizzed whether young Gill would bat up the order or not, saying they are "flexible". KKR take on Sunrisers Hyderabad in their opener on Sunday before playing Kings XI Punjab three days later, both at home.